This technique delivers your custom fonts quite consistently to all of these browsers, and degrades gracefully for those that don’t support it. Of course, there are always weird exceptions contingent in particular scenarios, but overall it’s a solid chunk of code put together from much research, experimentation, and testing. 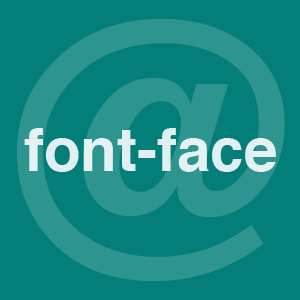 I share it here hoping it will help others implement custom @font-face fonts quickly and easily. Let’s step to it..
That’s the magic ticket. In the first ruleset, we are declaring which fonts to use for each of the four different formats. After this, the next three rulesets are used to actually display the fonts according to our desired property values. You can apply just about any CSS styles you wish, so long as the font-family (or simply “font” if you are using shorthand) contains the name of your custom font. Notice that we declare the font-family as “MuseoLight” in the first declaration block of the first ruleset. Then we also specify MuseoLight as the name of our first font for each of our heading selectors (h1, h2, and h3). After specifying our custom font, we then declare a couple of common system fonts – Verdana and sans-serif – to serve as fallbacks. In other words, this font-embedding technique degrades gracefully when the custom font is not displayed. Update: check out the followup post on @font-face code for more information on proper usage. There are many ways to obtain a good working set of fonts, but my favorite is Font Squirrel. They just make it so incredibly easy to download all of your favorite prepackaged @font-face kits. Just download, unzip, upload, and done! Don’t nest different @ selectors! Also important to keep in mind is that font embedding is only possible because of the many talented people who freely share their ideas, knowledge, and discoveries with the open-source community. Thanks to them, we can all look forward a better font-embedding experience in the future. Enhancing your design with some choice typography is a great way to beautify and personalize your website. Sure the CSS code looks rather grotesque, but it’s an effective solution for cross-browser font embedding. Just upload your four font files and slap in the code. It’s pretty simple, but feel free to ask any specific questions in the comments. I’m no font-embedding guru, but I’ve been designing with embedded fonts for quite awhile. As always, if you know of a way to improve on this code, speak up and share your wisdom! 1 Assuming the font is licensed as to allow such use. Could you explain the line that says: ‘src: local(“Museo 300”), local(“Museo-300”),’ Followed by three urls with format declarations and why that is different from the one line with the .otf? It is not at all clear where those different lines came from or how that would translate to another font. Thanks for another great post, btw. Looking forward to trying this out, but really have no idea what is going on in those different lines. Yeah, that’s a good point. I was trying to keep the article as simple as possible and not go into too much detail, but I see that more explanation of the code itself may be needed. I’ll either update the article or maybe even branch off into more of an “in-depth” post focusing entirely on the code and how to use it with it other fonts in a more general sense. Font squirrel is pretty epic – it makes it just so easy to use @font-face and cross browser too; I’m rather at a loss why more people don’t use it! Sorry, my last post should have been @Marty. I don’t think Jeff was lacking in that knowledge! @David, cufon is good, but only for headings. A bad idea for body text. Also, the list of browsers Jeff has tested this method in counts as widely available browser support in my book. @Marty: Here is a followup post with visual walkthrough of @font-face. If you declare real names in local(‘example’) it will prompt the user if they don’t have the font on their system which will result in a lot of people clicking cancel instead. An easy fix is to use local(‘☺’), at fontsquirrel.com they generate this code for you! Also Cufon puts in some nasty markup.. @font-face all the way. I love this and you happen to be using the font I need to use on my current designs. But why do you have to have the css file that is using @font-face in the same directory as the fonts? or is this just to make sure all the links in this example don’t break? You don’t. I use url(“../fonts/Museo300-Regular.woff”) format(“woff”) for example. You just need the relative path from the stylesheet to be correct. I’ll be sticking to Cufon for the foreseeable future, I cant handle how nasty @font-face looks in some browsers, when cufon is perfect in all of them. If I wanted custom body text (which nine times out of then, I don’t) then this would be handy. When its better supported and displayed in most browsers on most platforms however, @font-face will be a winner.